Because of the increasing cost of living, you would have experienced that it has been becoming difficult to manage your expenditure smoothly. As a result, an increasing number of people are now opting for a personal loan rather than dipping into their savings, when there is a cash crunch. Personal loans are unsecured loans issued to both salaried and self-employed individuals to fulfill their general household expenditures that are urgent and immediate in nature. Unsecured loans are not supported by any asset as collateral and are issued on the basis of key criteria such as income level, credit history, repayment capacity etc. However, the rate of interest on personal loans is higher than that on secured loans. You can get a best personal loan for expenses like renovation of your house, vacations, medical bills, lavish Indian marriage, or miscellaneous expenses. Most public and private banks and NBFCs (Non-banking financial companies) offer best personal loan in India. You should conduct a detailed comparison of personal loan interest rates, processing fees, pre-closure charges, eligibility criteria and other such important factors before choosing the best bank for an a personal loan. Let’s take a look at the list of 10 best banks for availing a personal loan in India. SBI personal loan is available for all salaried professionals and self-employed individuals. It offers personal loan under three categories – Xpress Credit Loan, SBI Pension Loan, SBI Saral Personal Loan. Why should you apply for SBI personal loan? ICICI Bank offers personal loans at attractive interest rates starting from as low as 10.99% p.a. In fact, the interest is charged on a reducing balance i.e. interest will be calculated on the outstanding loan balance every month. The notable features of ICICI bank personal loan are as under. Why should you apply for ICICI Bank personal loan? HDFC is a leading private sector bank that offers various banking products at affordable price. You can take upto Rs. 15 lacs personal loan in case you are self-employed without having a guarantor or a collateral security. Important features of HDFC bank personal loan are as follows. From 15.00% to 20.99% p.a. Why should you apply for HDFC Bank personal loan? Kotak Bank offers personal loans to all individuals whether they are salaried or self-employed. You can avail Kotak’s personal loan for sudden and unavoidable expenses like a wedding, child’s education, home renovation, travailing etc. Important features of Kotak Mahindra Personal Loan are as under. Why should you apply for Kotak Mahindra Personal Loan? Axis Bank offers great features and benefits on its personal loans such as flexible repayment tenure, lower processing fees, attractive interest rates etc. Some important features of Axis Bank personal loan are as under. From 15.5% - 24% p.a. Why should you apply for Axis Bank personal loan? Citibank offers personal loan for salaried class at a lower interest rate compared to self-employed class. Some notable features of Citibank personal loan are as under. From 10.99% to 17.99% p.a. Why should you apply for Citibank personal loan? Bajaj Finserv is a leading NBFC (Non-Banking Financial Company) that offers a wide range of products. It offers personal loans at the competitive interest rate for several personal requirements. Some notable features of Bajaj Finserv personal loan are as under. From 13.99% to 16% p.a. Why should you apply for Bajaj Finserv personal loan? Bank of Baroda offers personal loan for both salaried and self-employed individuals. Loan amount can be upto Rs. 10 lacs, depending upon your eligibility. Some prominent features of Bank of Baroda are as follows. From 11.60% to 16.60% p.a. Why should you apply for Bank of Baroda personal loan? Standard Chartered is one of the best online personal loan providers in India. The bank offers personal loan for various expenses which include vacations, daughter’s wedding, home renovation, higher education etc. Some prominent features of Standard Chartered personal loan are as under. From 10.99% to 19% p.a. Why should you apply for Standard Chartered Personal Loan? Tata Capital is one of the leading NBFCs (Non-Banking Financial Companies) in India. It provides personal loans to both salaried professionals and self-employed individuals. Tata Capital’s personal loan comes with several benefits like simple documentation, no collateral, no restriction to use. Notable features of Tata Capital personal loan are as under. From 11.49% to 19% p.a. 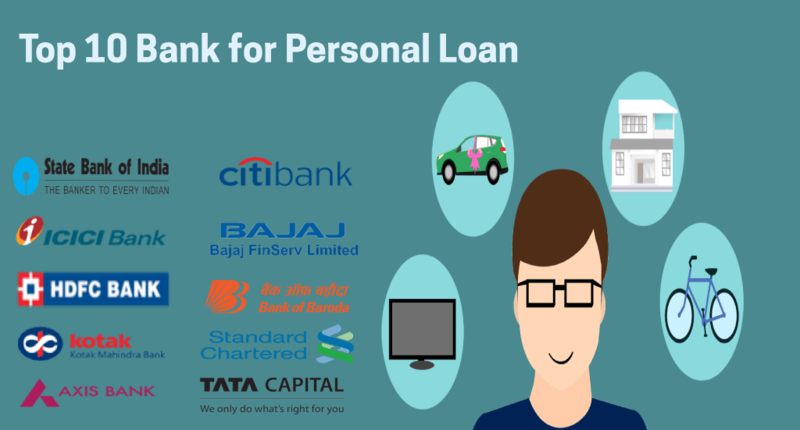 These are some of the leading personal loan lenders that provide attractive personal loan options at competitive interest rates. You do not have to submit any collateral or security for procuring these personal loans. For more information about the personal loan, please contact Afinoz.com as explained below. Afinoz.com is India's foremost online financial marketplace for availing loans and investments. Our main objective is to make the process of getting a loan or making an investment safer, convenient and hassle-free for individuals. We work with public and private banks, NBFCs and mutual fund houses across the entire country and offer an unbiased quotation on financial products. You can contact our team to get more information or apply for a loan or investment by calling on 0120-411-0376or by emailing at info@afinoz.com. Afinoz.com provides solutions which are quick, reliable, transparent, confidential and above all free.